YAKS is back in Mt. Shasta! YAKS has been serving house roasted coffee, pastries, paninis, salads and more for over 15 years. After a two year hiatus and a new version of our old self, aka YAKS on the 5, we’ve decided to return to our roots here in Mt. 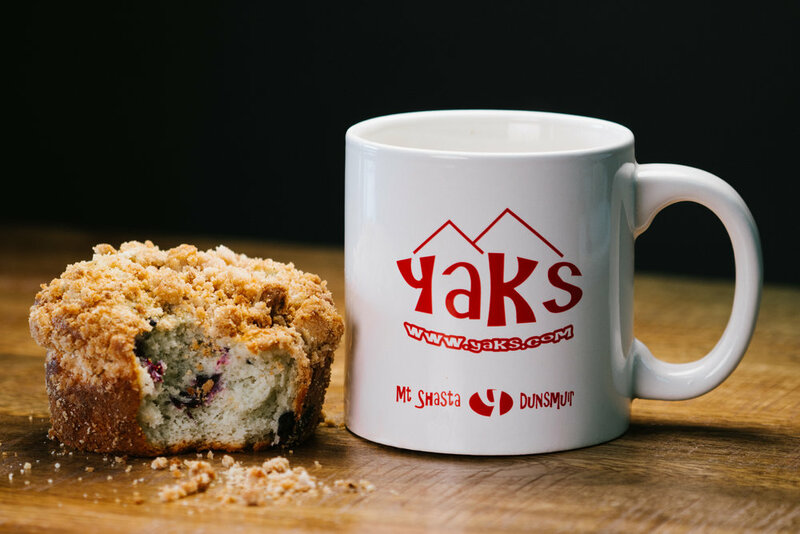 Shasta and relaunch YAKS - The Original Coffee House. chemically-laden sauces here, our world-famous marathon bars and cookies, and so much more. From the colorful walls, to the warm, inviting aroma of fresh coffee crema, it’s impossible to leave without a spring in your step, a smile on your face, and a tasty treasure in your hands. Served on a selection of any of our homemade bagels including Plain, Everything, Asiago Cheddar, Jalapeño Cheddar, Blueberry or you can make it Gluten Free for just $1.99! Egg, potato, pecan smoked bacon crumbles, cheddar cheese, with a touch of our homemade asiago ranch drizzle. Egg, pecan smoked bacon, cheddar cheese, and a touch of our homemade chipotle drizzle. Turkey, basil, asiago cheese, and a touch of our homemade asiago ranch drizzle. Egg, ham, asiago cheese, and our homemade asiago drizzle. Egg, mozzarella cheese, and a touch of our homemade pesto. Egg, cheddar, and a touch of our homemade asiago drizzle. Avocado, tomato, onion, basil, spinach, power greens, and a touch of our homemade pesto. Avocado, tomato, onion, basil, spinach, power greens, and a touch of our homemade thai peanut sauce. Egg, potato, chicken, pecan smoked bacon crumbles, cheddar cheese, and our homemade asiago ranch drizzle. Egg, potato, ham, asiago cheese, and our homemade asiago ranch drizzle. Bacon, ham, cheddar, egg, potato, and a drizzle of homemade ranch sauce. Egg, potato, black beans, onions, pepper jack cheese, and our homemade chipotle drizzle. Black beans, onions, tomatoes, potatoes, avocado, basil, spinach, and our homemade Buddha sauce. Romaine, chicken, dried cranberries, glazed cashews, feta cheese, crouton crumbles, red peppers, onions, and our homemade poppyseed dressing. Romaine, chicken, cheddar cheese, red peppers, onions, and our homemade poppyseed dressing. Romaine, chicken, tomatoes, feta cheese, crouton crumbles, red peppers, onions, and our homemade creamy pesto dressing. Romaine, chicken, pecan smoked bacon crumbles, black beans, asiago cheese, cheddar cheese, crouton crumbles, red peppers, onions, and our homemade asiago ranch dressing. Romaine, chicken, kalamata olives, feta cheese, crouton crumbles, red peppers, onions, and our homemade creamy balsamic dressing. Romaine, black beans, asiago cheese, crouton crumbles, red peppers, onions, and our homemade asiago ranch dressing. Romaine, kalamata olives, crouton crumbles, red peppers, onions, and our homemade balsamic dressing. Pecan smoked bacon, cheddar cheese, tomatoes, romaine, and homemade asiago ranch drizzle. Chicken, pepper jack cheese, tomatoes, and homemade chipotle cause. Turkey, basil, asiago cheese , and homemade asiago ranch drizzle. Chicken, tomatoes, mozzarella cheese, and homemade creamy pesto drizzle. Chicken, pecan smoked bacon crumbles, tomatoes, cheddar cheese. and homemade asiago ranch drizzle. Chicken, basil, kalamata olives, feta cheese, and our homemade asiago ranch drizzle. Basil, tomatoes, mozzarella cheese, cream cheese spread, and homemade creamy pesto drizzle. Avocado, onion, tomato, power greens, romaine, and veganaise. Rice, chicken, pecan smoked bacon crumbles, black beans, pinto beans, asiago cheese, cheddar cheese, onions, homemade chipotle sauce, and power greens. Rice, chicken, homemade thai peanut sauce, and power greens. Rice, black beans, homemade chipotle sauce, and power greens. Rice, black beans, pinto beans, homemade chipotle sauce, and power greens. Rice, pinto beans, homemade buddha sauce, and power greens. Romaine, chicken, feta cheese, onions, dried cranberries, glazed cashews, and our homemade poppy seed dressing. Romaine, bacon, turkey, tomatoes, and our homemade asiago ranch dressing. Romaine, chicken, black beans, red peppers, onions, and our homemade chipotle dressing. Romaine, chicken, kalamata olives, red peppers, onions, feta, and our homemade creamy balsamic dressing. Either classic or add a shot to make it "Dirty"
Creamy Hemp, Crisp Almond, or Refreshing Soy. Peanut butter and our homemade chocolate syrup! A little extra kick of chocolate! Made with our homemade peanut butter syrup! Orange juice, banana, non-fat yogurt. Ginger, spinach, banana, orange juice. Strawberry, blueberry, banana, apple juice, non-fat yogurt. Peach, banana, orange juice, non-fat yogurt. Strawberry, banana, apple juice, orange juice, non-fat yogurt.